These resources support learners in developing essential skills and knowledge needed to prepare them for their OCR Functional Skills qualification in English at Level 2. Learners can work through engaging interactive study sessions, including real-life scenarios with practical tasks to help them to practise their English skills and apply their knowledge while preparing for an OCR Functional Skills English assessment. The resources will enable pupils to become more confident and capable when using their speaking, listening, reading and writing skills in work and life. 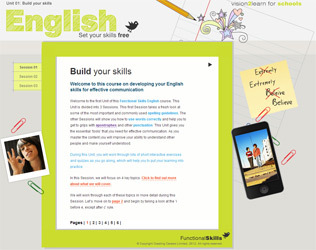 In these resources, learners will need to work through two units to help to prepare for a Functional Skills English assessment, in particular the OCR Functional Skills qualification in English at Level 2. The first unit in these resources gives learners the essential ‘tools’ that they need for effective communication. Learners will take a fresh look at some of the most important and commonly used spelling guidelines. They will also learn how to use words correctly and develop a clear understanding of apostrophes and other punctuation. As they master the content they will improve their ability to understand other people and make themselves understood. The second unit shows learners how to get to grips with the many practical tasks that they may need to complete throughout their life, including constructing emails, letters, reports, job applications and CVs. It also helps them to think about the way information is presented visually and how they communicate with people in person.